Based on the design of the old Burns Tri-Sonic® Pickups for a richer single coil sound, the Jaguar Sonic '60s Mid-Range have been designed for a fatter, fuller, hotter, more mid-range, dirtier sound. With custom tooled chrome plated covers drawn from thin brass and ferrous steel claws, my Creamery Sonic '60 pickups really do give a rich, versatile, grittier Jaguar sound. With handwound coils pressed around the custom designed magnets and wax potted in a combination of paraffin & beeswax, the Sonic '60 'Mid-Range' Jaguar replacement pickups give that richer, musical sound synonimous with the old classic Burns Tri-Sonic® design but in a new fatter, fuller, dirtier & grittier sound with more emphasis on the mid-range. I designd these after feedback from Jag players who loved the brighter standard Sonic '60s I made for them but wanted a fatter, hotter, more mid-range version in their 2nd Jag to compliment - Not everyone has two Jags so if you're looking for more mid-range to your sound, and want something a little different, an alternative to the classic bright Jaguar pickup, then maybe the new Sonic '60 'Mid-Range' pickups could be for you. Whereas the standard Sonic '60s are wound with thicker 42awg coil wire and are available in a variety of Alnico magnet choices, I spent a long time on the new 'Mid-Range' 43awg versions and concluded, after much testing, that the stronger Alnico 5 and Alnico 8 versions worked best. You can choose either based on your own preference, Alnico 8 being the strongest with a little more output and more cooler focus whereas the slightly weaker Alnico 5 is that little bit sweeter but with slightly less attack. 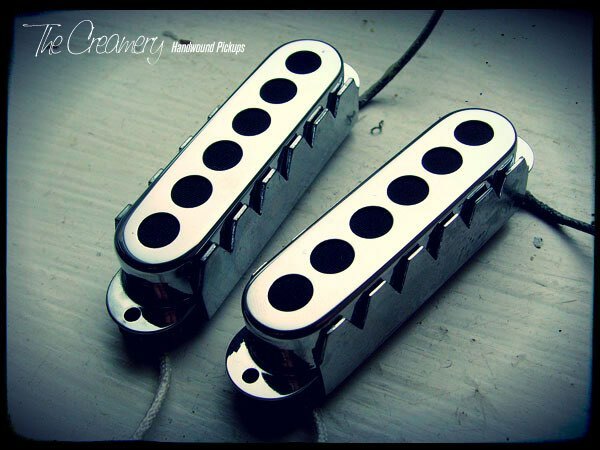 Wanting these pickups to be something special I've had custom chrome plated Jag covers manufactured. These aren't plastic covers, they're very thin brass that I've had custom tooled and chrome plated. I've also designed them with the Tri-Sonic® style oversize holes and more rounded/rolled edge covers for a unique Jaguar look. They do look good, especially with the classic aguar chrome control plates.